Dhaka, 29 Mar, Abnews: Prime Minister Sheikh Hasina yesterday called for uprooting all sorts of terrorism to establish a secured and prosperous region. "We must root out all kinds of terrorism to build a secured and prosperous region," she said when the national security chiefs of the BIMSTEC countries paid a courtesy call on her at her Ganabhaban residence here yesterday evening. The national security chiefs of the Bay of Bengal Initiative for Multi-Sectoral Technical and Economic Cooperation (BIMSTEC) are now in Dhaka to discuss security cooperation issues among the seven-member states of the regional grouping. This is the second such meeting held at state guesthouse Padma in the capital today. The first meeting of the national security chiefs was held a year ago in New Delhi. The prime minister expressed hope that the BIMSTEC countries will further strengthen their cooperation to stamp out terrorism from the region. She said containing drug abuse, human trafficking, cyber crime, maritime space threat and sea-level rise due to climate change are challenges for the region. "We've to innovate a system to face these challenges and find out a solution in a coordinated way," she said. The prime minister reiterated her government's zero tolerance policy against terrorism. "We've taken massive measures to create awareness among the youths, families and educational institutions about terrorism and extreme violence," she said. Sheikh Hasina also reaffirmed her government's firm stance not to allow anyone to use Bangladesh's soil for terrorist acts in other countries. She described again poverty as a common enemy for the development of the region and called for united efforts by all countries to eliminate poverty. The prime minister put emphasis on solving the problems between neighbouring countries bilaterally. She, however, said: "If there is more necessity, we could solve those multilaterally." The prime minister said the BIMSTEC countries will have to work together for maintaining economic development and sustainable growth of the region. She said as a founding member of the BIMSTEC, Bangladesh attaches priority to the regional cooperation. "We're firmly committed to deepen our relations with BIMSTEC member countries and we're very much active to strengthen this process," she said. The premier said establishment of the BIMSTEC secretariat in Dhaka in 2014 has demonstrated Bangladesh's commitment to the regional cooperation. Sheikh Hasina said the BIMSTEC has successfully celebrated its 20th founding anniversary and hoped that the regional grouping will take more steps to make the organisation more fruitful. The prime minister stressed the need for signing and ratifications of some conventions of security cooperation. "These framework agreements will ensure security of trade, economy and investment in this region and will help increase the economic growth of the people," she said. "We cannot keep our economic development process in unprotected and insecure state due to the threat of the terrorist attack," she said. 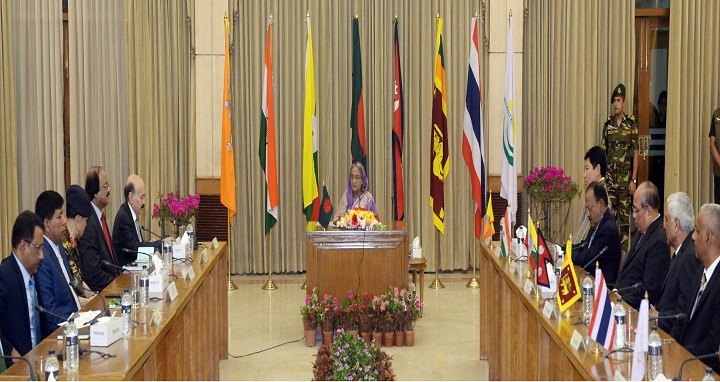 Sheikh Hasina pointed out that the BIMSTEC countries including Bangladesh will arrange some programmes including ministerial-level meeting in 2018 to further strengthen their cooperation. "We've to further strengthen our efforts to turn the regional organisation into a dynamic platform," she said. The prime minister conveyed her greetings to the heads of the government and state of the BIMSTEC member countries through their national security chiefs, the press secretary said. At the meeting, he said, Prime Minister's Security Adviser Major General (retd) Tarique Ahmed Siddiq apprised the prime minister of different aspects of the second meeting of the national security chiefs of the BIMSTEC countries.